GE is not typically a name you’d associate with food, but with its big data brisket party back at SXSW 2015 and now a new scientifically-developed hot sauce, the company might soon be more than just an appliance supplier for your household. 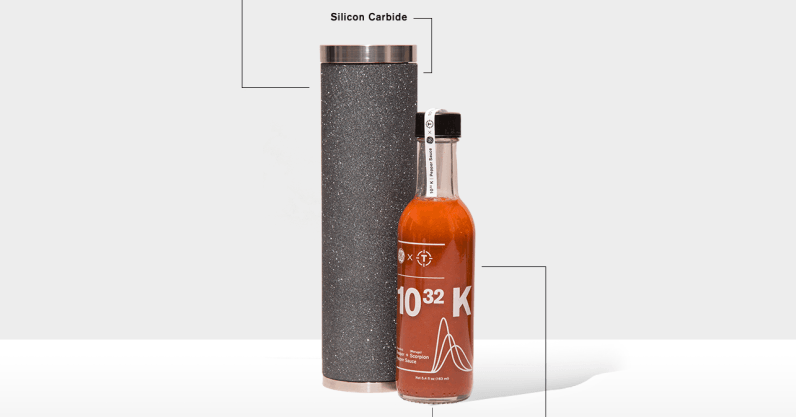 The company today launched 10^32 Kelvin, a sauce created in partnership with Thrillist that promises to pack as much heat as humanly possible. Hot sauces’ spiciness levels derive from an ingredient called capsaicin (a compound found in chili peppers), and GE has loaded nearly triple the density amount of this scorcher in its hot sauce compared to popular brands like Cholula and Tobasco. Of course, the pepper from which the capsaicin derives is just as important as how much is in the sauce. For 10^32 Kelvin, GE used a combination of Carolina Reaper and Trinidad Moruga Scorpion peppers, which measure in around 1.4 to 2.2 million and 600,000 to 2 million Scoville heat units respectively. For context, a jalapeño pepper typically comes in at around 5,000 Scoville heat units, making it seem like candy in comparison. To house all this heat, 10^32 Kelvin also comes in a heavy packaging made of Silicon Carbide and Nickel­-based Superalloys, or what the company describes as materials used in jet engine manufacturing. GE says storing the sauce in this protective shell helps prevent oxidizing the sauce, and thus preserving the heat and taste. You won’t need much of this to flavor your next recipes. Only 1,000 bottles of 10^32 Kelvins were made for purchase and they’re already sold out– if you’re up for the challenge, you can try snagging a bottle by entering a giveaway.